The ancient Philistines were embarrassed when Dagon, their chief idol, fell on its face before the Ark of the Covenant, so they propped it back up again.1 Maybe today’s evolutionary ecologists feel the same as they repeatedly try to fix the failings of their favorite evolution-based theories. Evolutionists assume the inanimate environment itself was the causal “origin of species.” But real-world ecological research continues to impeach the Darwinian assumption that animals are passively shaped and redefined by nonliving geophysical forces. Ecosystem engineering, a new analytical concept, illustrates how secularists are “always learning and never able to come to the knowledge of the truth” (2 Timothy 3:7). How so? This analysis does represent an increase in learning about nature, but it simultaneously represents a failure to reach the true target—genuine knowledge. Ecologists have long recognized that organisms can have important impacts on physical and chemical processes occurring in the environment. While some influences invariably arise from organismal energy and material uptake [i.e., eating and drinking] and waste production, many organisms alter physical structure and change chemical reactivity in ways that are independent of their assimilatory [i.e., uptake] and dissimilatory [i.e., output] influence…. Some examples are too conspicuous to ignore, such as dam-building beavers or reef-forming mollusks. But the habitat modifications produced by other creatures have often gone unnoticed because they occurred underground, or underwater, or were otherwise “hidden in plain sight.” Eventually, the activist traits of many animals were recognized by open-minded ecosystem investigators. It was to incorporate this variety of abiotic environmental modification by organisms, along with its numerous consequences, that [Dr. Clive G.] Jones and colleagues (1994) proposed the concept of ecosystem engineering. In their first article on the topic, they defined ecosystem engineers as “organisms that directly or indirectly modulate the availability of resources (other than themselves) to other species by causing…state changes in biotic [i.e., living] or abiotic [i.e., nonliving] materials. In so doing they modify, maintain and/or create habitats” (Jones et al. 1994). Some animals drastically modify the abiotic environments in which they live. Beavers build dams that change waterflow in freshwater streams. They also fell trees and thus remove obstacles to sunlight. Termites radically alter soil with interconnected tunnels and air columns above ground, with mounds that can reach eight feet high! Reef-forming mollusks construct huge underwater structures that provide shelter for marine life as well as obstacles to underwater currents. Walruses disturb sea sediments as they hunt clams, reshaping large patches of seafloor invertebrate community “real estate.” Earthworms recycle nitrogen-fixed compounds in soil, increasing subsoil aeration and water drainage and forming networks of underground burrow-tunnels. Other examples include alligators, bison, caddisflies, corvids, ghost shrimp, mole-rats, mycorrhizal fungi, periwinkles, pikas, and salmon. Do Ecosystem Engineering Explanations Clarify Ecology? The previous simplistic “keystone” ecological approach assumed that one super-influential animal was the essential foundation needed to facilitate a local habitat. But the ecosystem engineering approach recognizes that many organisms simultaneously play different yet interdependent roles in influencing the options and interactions of a habitat’s community of life forms. They also impact the nonliving geophysical ingredients within that given habitat.4 This is similar to how simplistic notions of food chains have been replaced by analysis of complex food webs. Beyond self-adjusting, creatures variously alter their habitats, from the modest effect of a bird’s nest in tree branches to the enormously influential picoplankton-filtration impact of Chesapeake Bay oysters and mussels that prevents algal bloom and low-oxygen dead zones in estuarial waters.7 But ecosystem engineering analysis doesn’t go far enough in its observations and explanations because it ignores God’s big-picture purposes and designs as it credits bacteria and earthworms with engineer-like wisdom. Thus, the term “ecosystem engineering” is misleading. It distractingly treats the habitat-changing animals as if they are intelligent engineers that inventively utilize mechanical solutions that impact geophysical environments. In short, the engineering genius involved in nature is God’s, not that of the animals He created. The engineering genius involved in nature is God’s, not that of the animals He created. 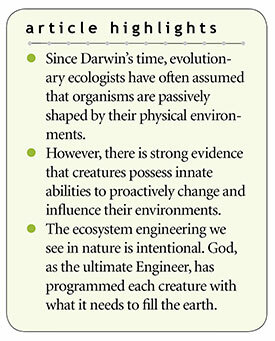 Even early critics of the ecosystem engineering term faulted the phrase as implying humanlike engineering “intent.”4 Whenever animals modify their habitats in physical ways, Christians should recognize the engineering “intent” as God staging an ongoing drama to “fill the earth,” which has always been His purpose for His creatures.8 Without the big picture of God’s Word, people will continue to learn without reaching true knowledge, and ecosystem engineering explanations will continue to miss the mark. Johnson, J. J. S. 2010. Tackling Charges of Biblical Inconsistency: Putting the Pieces Together to Form the Big Picture. Acts & Facts. 39 (7): 8-9. Secularists, consciously or unconsciously, don’t like to be told by God how to understand creation, so they try to solve nature’s puzzles without consulting Scripture for facts or insights. Jones, C. G., J. H. Lawton, and M. Shachak. 1994. Organisms as Ecosystem Engineers. Oikos. 69: 373-386. Wright, J. and C. G. Jones. 2006. The Concept of Organisms as Ecosystem Engineers Ten Years On: Progress, Limitations, and Challenges. BioScience. 56 (3): 203-209. With all the Darwinist emphasis on antagonistic competition between species, the ecological realities of mutualistic neighborliness in biotic communities was downplayed and/or dismissed. Johnson, J. J. S. 2010. Misreading Earth’s Groanings: Why Evolutionists and Intelligent Design Proponents Fail Ecology 101. Acts & Facts. 39 (8): 8-9; Johnson, J. J. S. 2018. Grand Canyon Neighbors: Pines, Truffles, and Squirrels. Acts & Facts. 47 (10): 21; Johnson, J. J. S. 2017. Cactus, Bats, and Christmas Gift-Giving. Acts & Facts. 46 (12): 21. For example, see Guliuzza, R. J. 2018. Engineered Adaptability: Fast Adaptation Confirms Design-Based Model. Acts & Facts. 47 (9): 18-20; Guliuzza, R. J. 2018. Engineered Adaptability: Sensor Triggers Affirm Intelligently Designed Internalism. Acts & Facts. 47 (2): 17-19. Pipkin, W. 2018. Freshwater bivalves flexing their muscles as water filterers. Chesapeake Bay Journal. 28 (7): 1; Gedan, K. B., L. Kellogg, and D. L. Breitburg. 2014. Accounting for Multiple Foundation Species in Oyster Reef Restoration Benefits. Restoration Ecology. 22 (4): 517, cited in Virginia Institute of Marine Science. Study puts some mussels into Chesapeake Bay restoration. ScienceDaily. Posted on sciencedaily.com September 8, 2014, accessed December 20, 2018. Cite this article: James J. S. Johnson, J.D., Th.D. 2019. Ecosystem Engineering Explanations Miss the Mark. Acts & Facts. 48 (3).